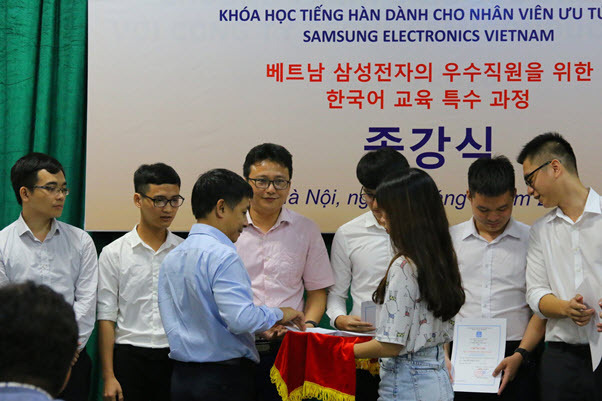 On September 14th, 2018, the University of Languages and International Studies – Vietnam National University, Hanoi (ULIS – VNU) organized the closing ceremony of the second 2018 Korean language course for excellent staff of Samsung Electronics Company. The ceremony was attended by Assoc. 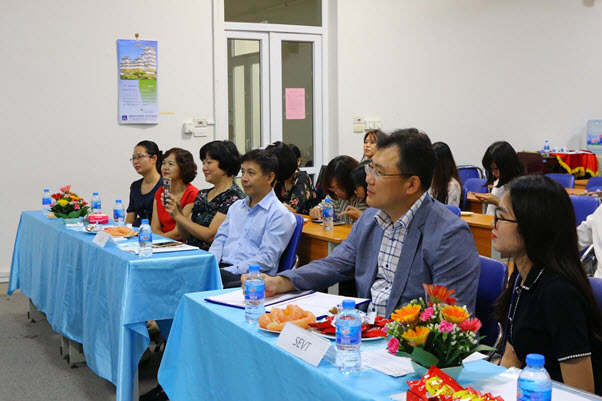 Prof Lam Quang Dong – ULIS’s Vice President, Dr. Tran Thi Huong – Dean of the Faculty of Korean Language and Culture (FKLC), Dr. La Thi Thanh Mai and MA. Nguyen Thuy Duong – Vice Dean of the Faculty of Korean Language and Culture, lecturers and class monitors. 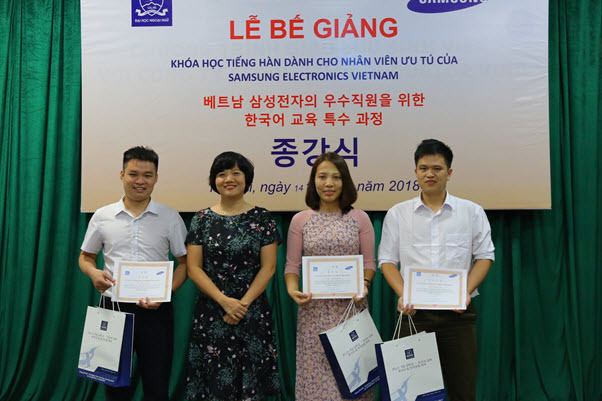 From Samsung Electronics Vietnam, Thai Nguyen branch, Mr. Seo Byung Kwon – Director of Administration and Human Resources, Mr. 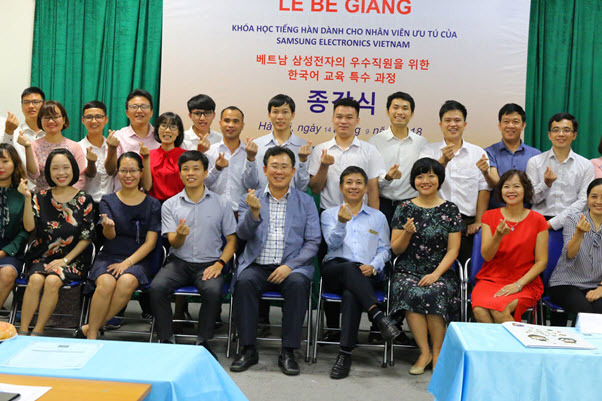 Le Van Thang – Head of Training Department and especially 15 learners of the course participated in the ceremony. 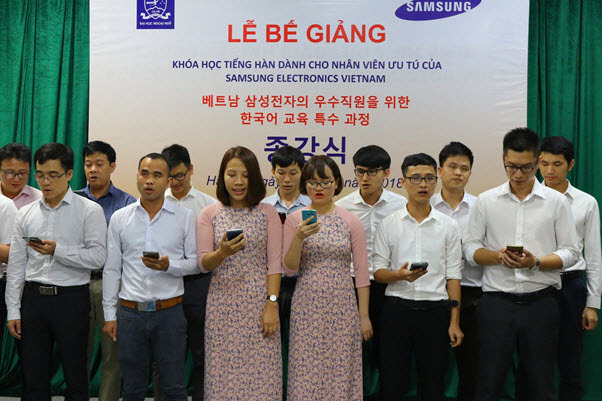 Addressing at the ceremony, Vice President Lam Quang Dong extended his congratulations to 15 excellent staff of Samsung who had completed their short Korean course. 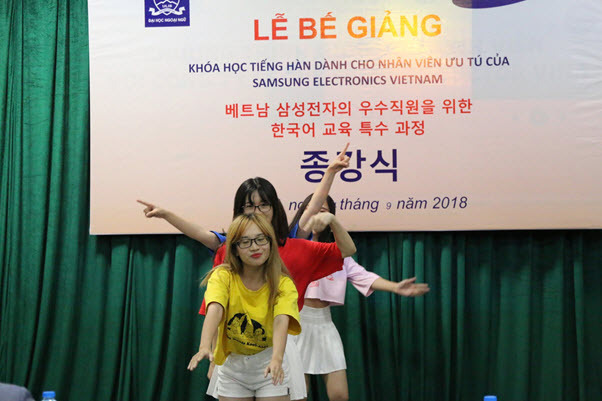 Having spent 6 months doing research in Korea, Vice President Lam Quang Dong said that he loved the country and the culture very much. He hoped that the students would continue to explore new academic frontiers, try their best to practice and apply what they have learnt at ULIS in their future work and become a bridge to the increasingly strong relationship between ULIS and the company. 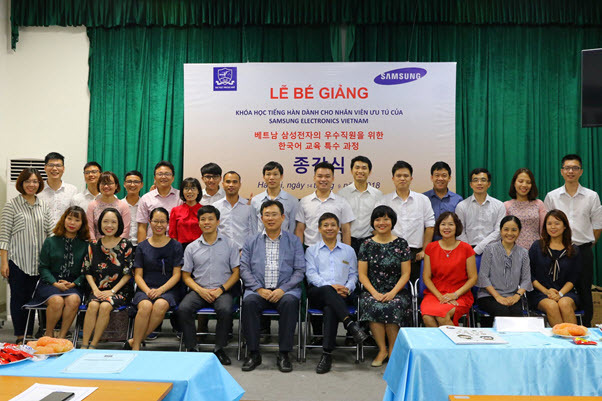 On behalf of Samsung Electronics Vietnam, Mr. Seo Byung Kwon highly appreciated the effectiveness of the Korean language course taught by ULIS teachers. The company’s success over the past years has been achieved certainly thanks to the support of partners, especially ULIS. In the past years, FKLC has always been a reliable partner of the company with many effective cooperative activities in training, internship and recruitment. 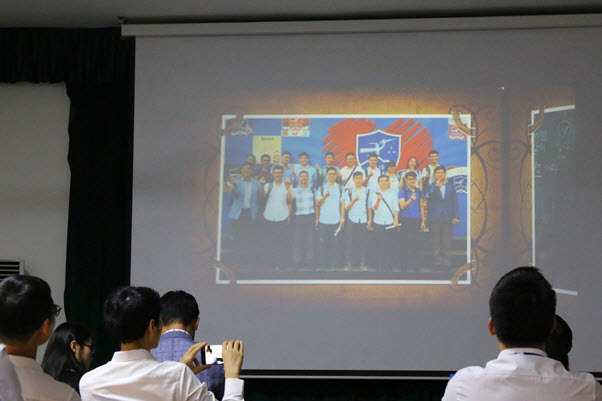 Although three months is not a long period, Mr. Seo Byung Kwon believed that with the knowledge that the students had learned, they would love Korean language more and invariably try to refine essential skills for practical application. The ceremony was closed by presenting certificates to the students. Three students who had achieved the best academic results received certificates of merit and gifts from the University. Before the parting, the students sang Korean songs to express the gratefulness of all class members to their teachers. 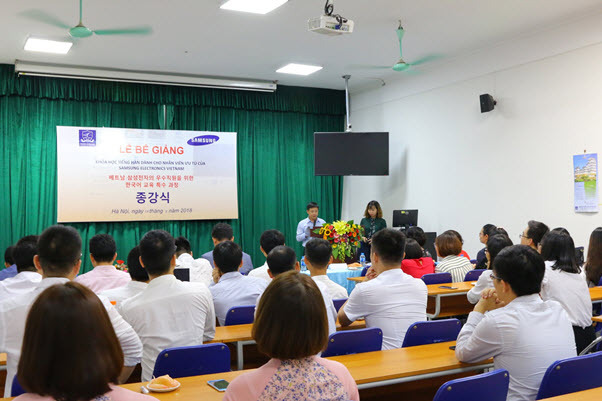 Korean language course for excellent staff of Samsung Electronics started in 2014 and up to now the company has successfully organized 12 courses with 196 students trained in total. Each successful course marks the efforts of all students as well as recognizes the dedication and enthusiasm of all teachers throughout the course. 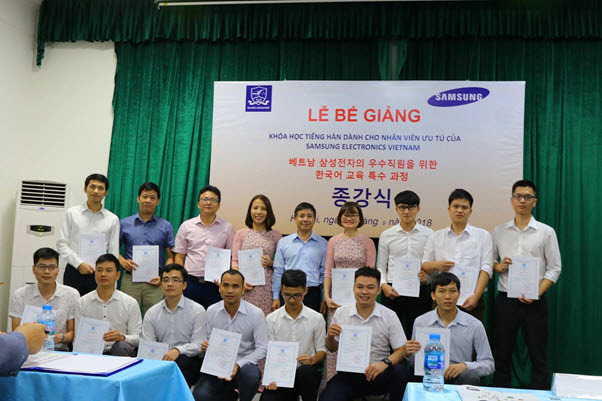 The training quality has been affirmed by the number of standard output exceeding the target set by Samsung.